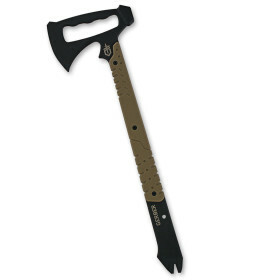 Gerber Downrange Tomahawk » Protective Solutions, Inc.
For emergency situations, the Gerber Tactical Downrange Tomahawk will break down barriers without restraint. The Tomahawk features a beveled edge axe head for cutting and a blunt hammer block for smashing, with a carefully designed cutaway handle integrated into the lower part of the ax head for leverage when using the pry bar. The handle is made of 420HC steel with a ceramic coating, wrapped in machined desert tan G-10 for extra grip when conditions get messy. It comes with a MOLLE-compatible sheath that easily attaches to webbing equipped packs or body armor.